It’s time to add another project to the “Done” list! This lava flow cowl, knitted for a special someone, is my latest finished knitting project, and my first foray into the world of cable knitting! The pattern is a free download, available here on Ravelry. I learned a few lessons from this project, which I will elucidate for you here. The provisional cast-on is a technique whereby you pick up and knit your first row from a crocheted chain. The idea is that later, you can unzip the crocheted chain and put live stitches back on your hook in order to do a graft (more on that later). Provisional cast-on and stitch counter are both visible here. Picking up and knitting from a crocheted chain might sound very simple to those who know how to both crochet and knit, but there is one little trick to keep in mind: The stitches must be picked up from the back of the chain. As Staci from VeryPink Knits explains in this video about doing a provisional cast-on, the knit stitches should be picked up from what she calls the “hyphens” on the back of the crocheted chain. Of course, I hadn’t watched that video when I did my provisional cast-on. So “unzipping” my chain was more of a nightmare than anything. Oh well, you live and learn! 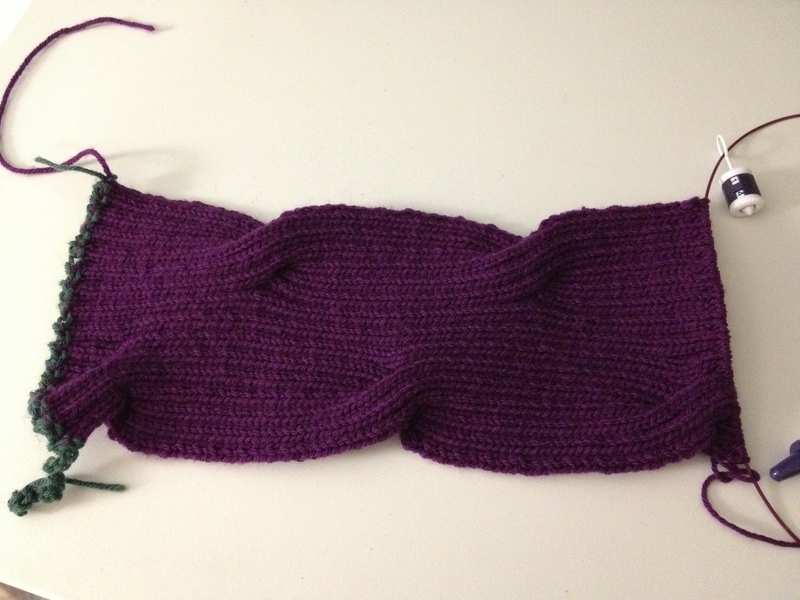 This pattern calls for repetitions of 21 rows of rib stitch knitting. As you can imagine, it’s easy to lose count if you’re not paying attention, and I’m still learning to count rows in knitting. So I got myself a handy-dandy stitch counter, which lives on your cable (or whatever you’re using to knit). 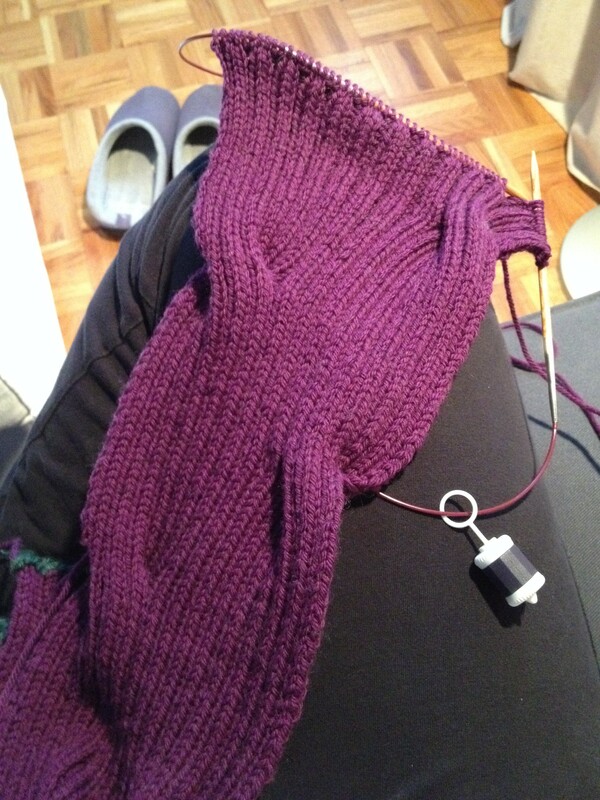 But of course, the trick of using the stitch counter is to actually update it at the end of each row. A tool is only as effective as its user makes it. 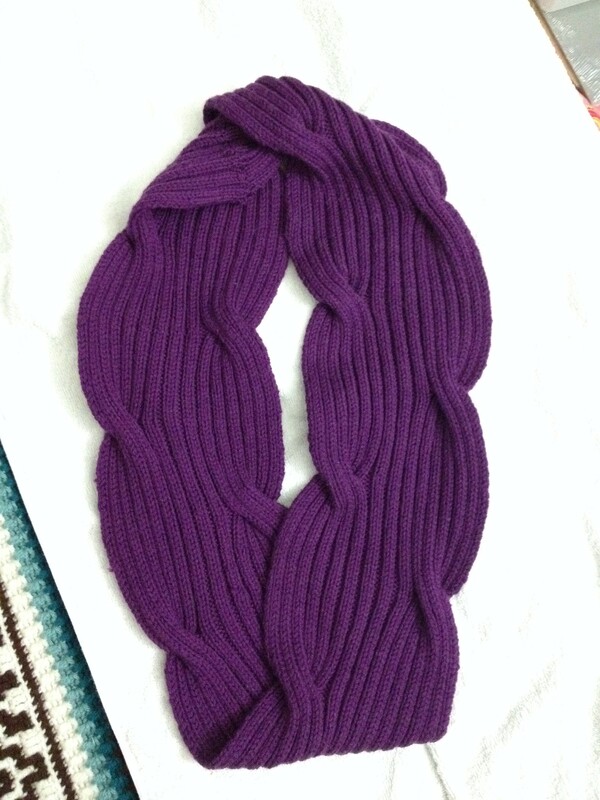 I picked the yarn for its softness and its color. It’s Diamond Luxury Fine Merino Superwash DK in a vibrant purple, and squeezing it in the yarn store was such a pleasure. Sadly, though, part-way through the project I noticed that it was starting to pill! That’s when I went on Ravelry and read the reviews of the yarn. To my dismay, I learned two things: The yarn pills terribly and it loses its shape when washed and must be thrown in the dryer for a bit in order to reshape it. While my mess-up with the provisional cast-on was annoying, it wasn’t too detrimental to the outcome of the cowl. What was a big mistake was my neglecting to practice the grafting technique ahead of time. Grafting, or the kitchener stitch, is when you take two sets of “live” stitches (meaning they’re still on your needles) and graft them together with some yarn and a sewing needle, so that there is no seam. Once again, I referred to YouTube and VeryPink Knits for some help. Her video about grafting in rib stitch is excellent, as are the written instructions in the video description. But foolishly, instead of practicing a grafting on a couple of swatches of yarn like Staci does here, I decided to go ahead and do it directly on my work. As you can see from the photo above, it didn’t work out so well. Despite All That, I’m Proud of My Lava Flow Cowl. The recipient, my colleague and friend Marjorie, is delighted with it. She says it keeps her nice and warm without itching, and the grafting is pretty well hidden when she wears it. So far, the pilling has not proved to be as much of a problem as I feared. I didn’t mention the cables! 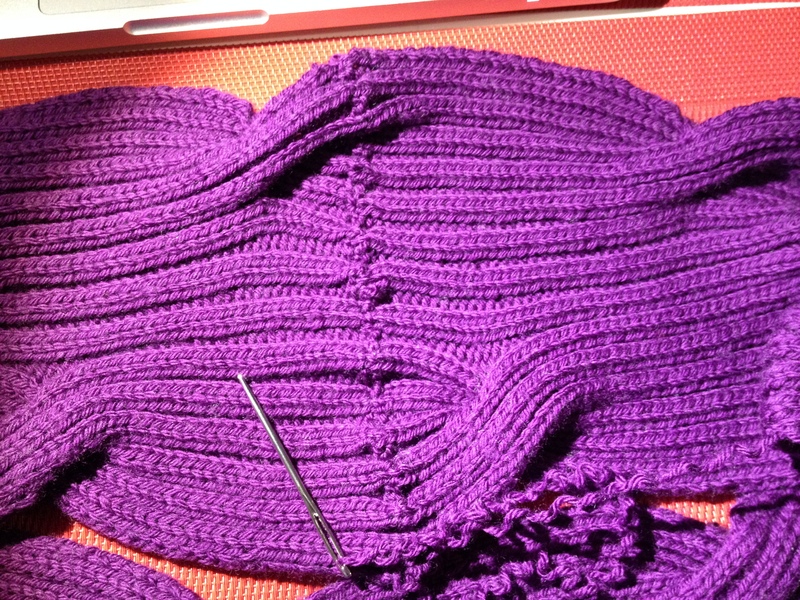 They were actually super easy to knit, but the key is to keep your stitch loose. I’m still working on that as a relative newbie. I really enjoyed your article here. A lot of valuable lessons learned. Lol You did a great job! I posted it on my Facebook page, Twitter, & Google+ . I just thought you might like to hear what I had to say… I really like it.